Dark red, yellow, and blue is the combination of Jay's signature colors. 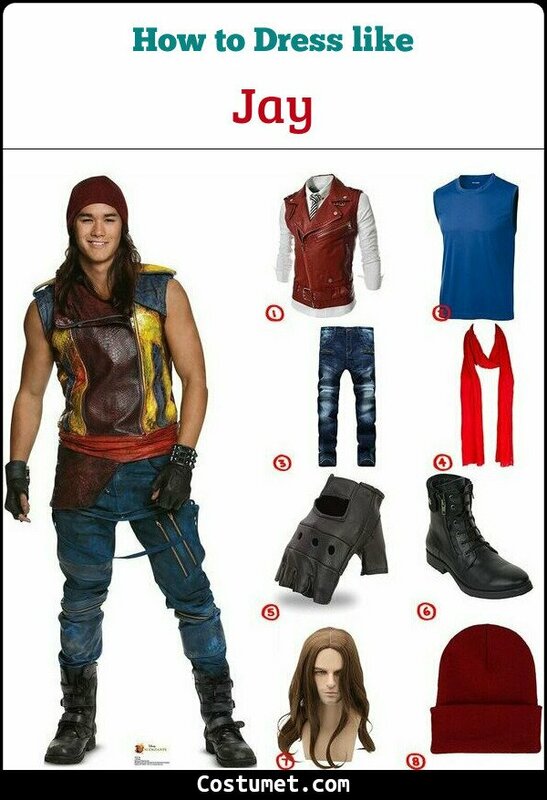 He wears a red leather vest with a touch of yellow and blue, blue pants, black finger-less gloves, dark red beanie hat, a red fabric belt, and black combat boots. If you wish to recreate Jay's awesome style, checkout our list down below! 1 Red Leather Vest Get a plain deep red leather jacket vest to wear. 2 Blue Sleeveless T-shirt Wear a blue T-shirt with no sleeves under the jacket vest. 3 Dark Blue Pants Look for a pair of dark blue pants with zippers to match your top. 4 Red Scarf Use a red scarf to tie around your midsection as a red fabric belt. 5 Black Finger-less Gloves Look for a pair of black finger-less gloves to wear. 6 Black Leather Boots Match you outfit with a pair of black leather boots. 7 Brown Long Wig Wear a brown long wig to recreate Jay's hairstyle. 8 Dark Red Beanie Hat Get a dark red beanie hat to wear over your wig. 9 Full Costume for Kids Get the full costume for your little brother or children. Jay, portrayed by an American actor Booboo Stewart, is one of the main characters in a 2015 Disney TV movie Descendants (and its sequels), which is about the children of all well-known villains such as Maleficent and Evil Queen. Jay is the son of Jafar, the antagonist in Aladdin. Comes with his handsome look is wit and sneakiness. He also believes that he must get everything that he wants. Trying to earn his father's respect, he's trying to steal the 'big prize'. However, Jay eventually finds happiness in friendship. Carlos wears a black T-shirt topped with a black-red-white leather jacket, red cargo shorts, red finger-less gloves, a spiky bracelet, a black leather belt, a fur tassel key chain, and black boots. Ben wears a rustic yellow T-shirt topped with a royal blue leather jacket, a black beanie hat, blue rustic pants, a dark blue belt, and dark blue sneakers. Lock wears devil costume with tail and pitchfork. Shock has a witch with her purple dress, black tights, and hat. Barrel is a skeleton and wears a skeleton-themed sweater.